Taver, We Hardly Knew Ye …. The Aramark indoor football field is twice as big as the old Student Pavilion and the ceiling is high enough for kicking practice. Notes, quotes and anecdotes from about as interesting an offseason week for Temple football as we’ve seen in some time …. Going from defensive coordinator at Temple to a defensive backs’ coach at Ohio State is mostly seen as at least a lateral move, certainly not a step up in the coaching fraternity but if it floats Johnson’s boat, go for it. Heck, Taver had the same job at Purdue before being enticed to leave there for the DC job at Temple one year ago. Temple was ranked No. 56 in total yardage defense and No. 58 in scoring defense a year ago and that screams two words to me: Mediocre and Replaceable. Giving up 28 (really, 21) points to UConn and 13 points to a Villanova team that Rhode Island … Rhode Island … held to six is not a ringing endorsement of last year’s defense. With the dissolution of the Bruce Arians’ staff in Arizona, there are a number of “overqualified” guys with Temple connections who Hall of Famer Paul Palmer told me were definitely interested in the job: Former FCS Defensive Coordinator of the Year Nick Rapone and Kansas City Chiefs’ Hall of Famer Kevin Ross. If one or both are hired, they immediately become the two best defensive coaches on the staff. Both guys are Temple (and Tempe) TUFF, love Temple, and would be a positive influence on the kids and their fellow staffers and the fans. This is about the biggest no-brainer in Temple history. Neither would leave Temple for lesser positions, even at Alabama. Of course, Temple being Temple it hired another less-qualified guy from the one of the same two directional Alabama schools Bobby Wallace last coached, West Alabama. It would have nice for Collins to look around and grab a guy or two from the pre-Al Golden Era at Temple. Sometimes, you think he believes Temple did not have football before 2005. This was one of those times. Now that Nick Sharga has left, we all have to find our next favorite player on the Temple team. Mine has been Isaiah Wright since the end of our season. That guy was Isaiah Wright and it was the first time I had the pleasure of meeting him in person. He extended his right hand. Then Isaiah introduced me to the guy sitting on his right, Linwood Crump (Junior), and I told the defensive back that he was going to be a starter but to not take anything for granted. Both can call me Mr. Mike any day of the week and, just maybe, they will give him No. 4 before the start of the season. Whatever number they give him, I just hope they don’t make him disappear like they did with Nick Sharga. Moody Nolan is listed as the architect for the new football stadium. That said, it takes up such a large portion of the 15th and Montgomery area that it would now be pretty hard to see how a 35,000-seat stadium could fit in a North-South configuration. It would have to be East-West and cross and close 15th Street permanently with the Student Pavilion and tennis courts knocked down. Had the Pavilion been knocked down and replaced by what is now Aramark first, there would have been no need to close down 15th Street. Now it is really hard to conceive of a stadium fitting into the old Geasey Field square footage alone but that could be the least of Moody Nolan’s problems. I later learned that was Phil Snow. After a rocky start at Temple, Snow put his defense in place and, by the second AAC championship game he coached in, there were few better in the country. I wasn’t a big fan of Phil at first, but he won me over four years later when it took him that long to put in his defense. Geoff Collins might be wise to consider the same approach now that Taver Johnson is headed to Ohio State to essentially fill the 10th coaching spot Adam DiMichele filled at Temple. With all due respect to Andrew Thacker, he simply doesn’t have the experience at an important position that a school as large as Temple should demand. Nick Rapone, who was the defensive backs coach with the Arizona Cardinals (Temple West, located in Tempe) for Bruce Arians, does and he has the ability to put any type of defense in at a faster rate than even the Sainted Phil Snow did for the Sainted Matt Rhule. You want real Mayhem? Hire Nick Rapone. Rapone’s daughter graduated from Temple and Rapone himself has some deep ties to Philadelphia and the Owls, having served two stints as an assistant here already. As DC at Delaware, Rapone was a part of two NCAA national runner-up teams, including in 2010 when he helped the Blue Hens to a 12-3 record and a share of the Colonial Athletic Association title. Rapone was named the 2010 FootballScoop NCAA Division I FCS Coordinator of the Year as his defense led the nation in scoring (12.1 ppg), ranked fifth in total defense (280.7 ypg) and was 12th in rushing defense (105.3 ypg). The secondary included four All-CAA performers, including All-American selections Anthony Walters and Anthony Bratton at safety. The Hens also ranked ninth in the nation in passing efficiency (102.7), and the team’s 21 INTs were the third-highest total in the nation at the FCS level. He was the Owls’ defensive coordinator under Arians and the Owls more than held their own as a defense against two top 10 schedules under him. Most importantly, he’s available and he does have extensive DC experience at the highest levels of football, not at developmental programs like Kennesaw State. That’s what Thacker does not have nor did Johnson. Neither of those guys have any history of stopping offenses. Rapone has a long and storied one. 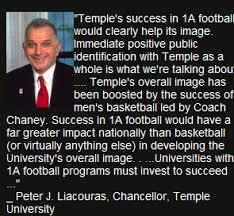 Like Rhule said back then about Snow, I think that’s just the kind of guy Temple needs. Collins should at least pick up the phone and give him a call. The last time Taver Johnson attended a Temple game the crowd was 1/15th this large. The last time Temple fans saw Taver Johnson in action as a defensive coordinator, the Owls’ program was in the gutter and in desperate need of intervention. Probably none of them remember him. Then, Johnson was the DC at Miami (Ohio) and there was an announced crowd of 11,257 (“missing about 9,000 no-shows” according to an AP story on the game) in the stands at Lincoln Financial Field but, in reality, you could count the crowd in about 20 minutes and probably come up with one third of that number. Outside, before the game, there were five fans tailgating in the rain in Lot K waiting for the game to begin right up to a half-hour before kickoff. Taver Johnson’s last stop was Purdue. Five, as in the number that comes after four and before six, and the day will go down in Temple football infamy, Oct. 29, 2005. The entire lot was empty except for those five fans. In all fairness, in those days there was a larger group of Temple tailgaters a couple of lots over at the Jethro Lot but those five in two cars were all that showed in Lot K that rainy day. The gloomy rain was a fitting backdrop for a program that hit rock bottom with only two directions apparent: Up or out. The talk of tailgate that day was speculating on the miracle man who could save the program because then coach Bobby Wallace had already announced he was not coming back at the end of the year, nudged out by the administration. Rick Neuheisel’s name came up, as did Frank Solich’s. Al Golden was an unknown at the time to any of the five Temple fans left. I know. I was one of them. The other four shall remain nameless, but they have all witnessed a rebirth in the program and the tailgate atmosphere that is truly remarkable. The Owls were able to start crawling out of the gutter a couple of months later when a Virginia assistant coach named Al Golden, also a DC, was named head coach. Johnson’s defense was impressive in a 41-14 win over the Owls, but so was every other defense that played against the Owls that year. That was the ninth loss in an 0-11 season on the way to 20-straight losses. Now Johnson is back and will roam the sidelines in the same capacity this year as DC of the Owls. Ironically, same sideline, too, because the “home” side for Temple was the other side of the Linc in those days. It seems like a good hire for new head coach Geoff Collins. In that year of 2005, Johnson presided over a Miami defense that spearheaded a 7-4 record. In addition to “holding” Temple to two touchdowns, his defense limited Cincinnati to 16 points, Buffalo to 13 and Ohio to 10. That was Johnson’s only experience as a FBS defensive coordinator. His most recent experience was Purdue defensive backs’ coach the last two years and that was the same Purdue team that gave up 63 points to Penn State. Still, he brings a mostly P5 coaching set to Temple and that has to be a plus because he will go on the recruiting trail looking for a P5 skill set. He was at Arkansas (linebackers and cornerbacks) in 2012 and 2013 and coached the cornerbacks at Ohio State from 2007-2012. He even served as interim head coach of the Razorbacks. When he finally roams the sidelines, he will see a whole other side of Temple, both on the field and in the stands, that he saw the first time and the impression should be a favorable one. We can only hope those fans have a favorable impression of the work Johnson does in their view, but we won’t know for sure until about midway through the 2017 season.